As a huge fan of the Peter Jackson et al movies set in Middle Earth, I once again rocked up to the latest installment of The Hobbit hoping it would be wonderful. Once again I enjoyed the movie — the lavish and dedicated depiction of Tolkien’s fantastical world, the rousing adventure, the eye candy in the form of Legolas and Kili… But once again I can’t help comparing it with the Lord of the Rings movies and came away wishing it had managed to be more. The Desolation of Smaug picks up more or less where An Unexpected Journey left off. Like the first movie, the second also follows the book reasonably faithfully in terms of major events — the meeting with Beorn, the giant spiders of Mirkwood, capture by the elves of Mirkwood, escape via the barrels down the river to Laketown, arrival at the Lonely Mountain… However, after mining as much of the book as possible for kernels from which to seed subplots, the writers did invent a fair bit of content to bulk out the movie. Legolas! 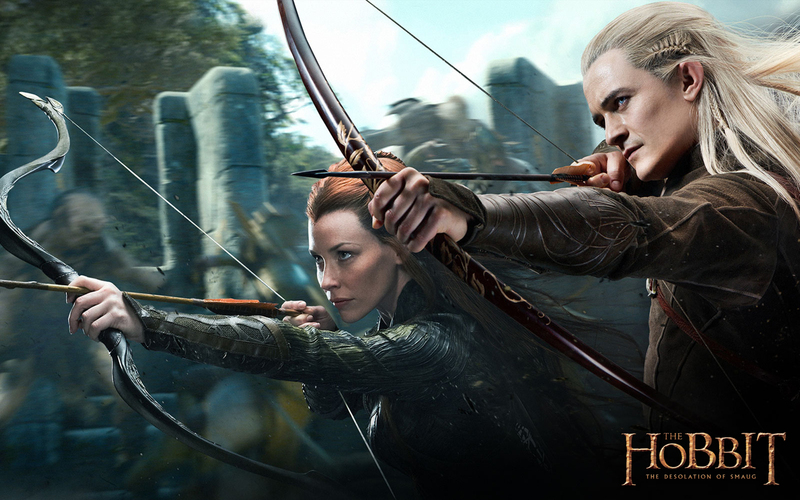 As soon as I heard they were filming The Hobbit years ago, I hoped they would bring Legolas (Orlando Bloom) into it. In LOTR Legolas was always the son of Thranduil, King of the Elves in Mirkwood (his father having sent him to the Council of Elrond), and it made perfect sense to me that if Thorin’s party of dwarves encountered the elves of Mirkwood then Legolas would be there. It doesn’t matter to me that his character isn’t mentioned in the book. Since they’re embellishing the story, they might as well centre it on Legolas – yes! The Legolas scenes are lots of fun — especially when he gets to kill orcs with those fabulous acrobatic-athletic moves. The dwarves-in-barrels escape scene is a great action scene. In the book it’s all rather mundane, but in the movie there are elves chasing dwarves, then orcs chasing dwarves, then elves chasing orcs… (Legolas balancing on dwarves’ heads as they float in barrels…) Arrows and axes flying everywhere. Awesome stuff. If you’ve seen the movie trailers, you’ll know they’ve added a token ‘she-elf’ (urgh) too. I guess the sentiment is good, because there are few other women in the film anywhere. Tauriel (Evangeline Lilly) is a captain in the Elf King’s guard, and is also a fearsome warrior. She develops a connection with Kili (Aidan Turner aka the hot dwarf), and already has the eye of Legolas, so there’s a little bit of a love triangle happening. Will be interesting to see where that goes. However, ALL these additional plot lines jangle a bit awkwardly together and slow the pace of the movie down. To me it seemed a fairly clumsy attempt to pad out the movie to nearly three hours — all part of the artificial stretch of a simple children’s book into three long films. On the other hand, I did rather like Gandalf’s (fabricated for the film) side journey to the abandoned tombs of the nine ring wraiths, and subsequent visit to the ruined citadel of the necromancer, where he learns of Sauron’s return. Although this is a blatant attempt to link The Hobbit more strongly to events in LOTR, I felt it worked — even if it renders Gandalf’s ignorance at the beginning of Fellowship a little odd. I also really liked the way Bilbo is a lot more hesitant to use the ring in the movie than in the book. One suspects Tolkien had no notion of how evil the ring was when he wrote The Hobbit… Bilbo slips it on and off at will, with no repercussions. Not so in the movie, where he definitely feels a sense of foreboding just holding it. Martin Freeman is once again a highlight as Bilbo. He really is perfectly cast. The film remains loosely centred around him, although less than the first film, I think. Nonetheless, he gets his big chance to shine when he sneaks into the dragon’s lair and confronts Smaug the dragon. 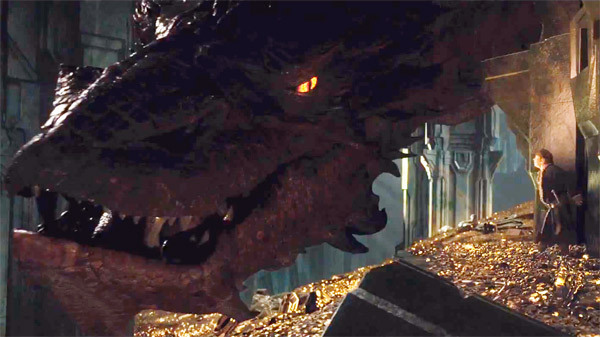 This is a great scene, although I confess I couldn’t sense much of Benedict Cumberbatch in Smaug. The journey through Mirkwood seemed very similar to the journey through Moria, with gnarly trees replacing caves. Thorin’s lust for the arkenstone was starting to affect him something like the one ring affects its bearers. I’m sure there are more parallels, and I’m not sure whether I liked them or not. The Hobbit is a different story, and I don’t think there’s a need for all the clumsy tie-ins. Overall I think I liked The Desolation of Smaug about the same amount as An Unexpected Journey. Both are enjoyable returns to Middle Earth, but simply can’t live up to the LOTR movies. As I said in my post on An Unexpected Journey a year ago, the source material just isn’t there. On second thoughts, maybe I liked The Desolation of Smaug a bit better… you know, Legolas. Heh. If you’ve seen The Hobbit – The Desolation of Smaug, I’d love you to share your thoughts here in the comments. I agree that 2 movies would have been enough. Maybe even one, although I do like some of the embellishing. Not that I consider myself a lover of the book. I don’t really. I just don’t think the story carries a tenth of the weight that LOTR does, and so suffers by comparison. Haven’t seen it yet, but I agree, Legolas is a pretty compelling argument. And I can kinda see Mr. Jackson’s difficulty – he’d raised the bar so high with LOTR that he probably couldn’t have made a simple children’s story. Though could he have aimed for somewhere in between? Yeah, I think that’s the problem. A children’s story was never going to cut it. But they would have done better to produce two longish movies, I think. I’m not objecting to the added bits on principle, but somehow they don’t quite gel with the story… I’d love to know how someone who hasn’t read the book at all thinks about the movie. Perhaps I just can’t divorce myself from it… Even though I tried! I haven’t seen this one yet. Kind of feel obligated because it was filmed where I live, Wellington NZ. I did see the first Hobbit movie and felt it came across like out-takes from The Fellowship of the Ring. I know they can write – years ago I attended a talk by Boyens, the co-writer of the LOTR series, who told me why they;d adapted it the way they did, and the reasoning made sense. I can’t help thinking they’ve dropped the ball with The Hobbit. If they wanted to make ‘epic’, the stories to use would be the ones from the Silmarillion – though, of course, they couldn’t as the film rights aren’t available. I really enjoyed this Hobbit film. With the LOTR in mind, Jackson had to set it in the same world, with at least most of the same feel, which gives a ‘bigger’ feeling to the movie. As far as having it in 3 movies is concerned, this movie made me understand his decision to make it a 3 part movie. The first one felt needlessly stretched out and long, but this one went from one scene to another without really wasting time. The material from the books, when done in this sort of detail, seems to require a bit more than 2 movies (hence all the extra ‘useless’ scenes in the first one). Yes, there can be no doubt The Hobbit movies have the same magnificent look and feel to the LOTR movies — which is what saves them, I think. Thanks for your comment! I haven’t seen this movie yet either. I saw the first Hobbit movie and was disappointed with the story. I will most likely go to see this installment, but with lower expectations. Probably the surest way to enjoy it! I went determined to divorce myself from the book, and I believe some of the invented parts worked really well indeed. Legolas!! I haven’t seen it yet either, and I might wait until I can catch it at home, like I did with the first Hobbit movie. It sounds like I’d enjoy it, but like the previous film, probably not as much as the classic trilogy. Oh, and if I remember correctly (it’s been a few years since the last time I read The Hobbit), I believe the Arkenstone does an adverse effect upon Thorin’s temperament–but it might have simply been his greed for the stone that seizes him, rather than a supernatural power like the Ring. Yeah, The Hobbit is a much lighter read. I think I’ve only read the entire LOtR one time, but I’ve read The Hobbit several. I’ve been meaning to give it another go, but there’s just so many books to read out there. I know what you mean… I don’t think I’d waste time on The Hobbit myself… The skim re-reading I’ve been doing has convinced me I don’t like it much! The side story about Gandalf heading off to tangle withf the necromancers army is hinted at in the Hobgit book with a one liner during / after the battle of the the five armies – to the effect that “I paid a little visit to the necromancer” – it does tie it I well. The effect of the horde of gold on Thorin is excellently built up, with the kings stone being the pinnacle of his desire making more and more sense as the story rolls out. I would have preferred Beorn’s storyline to have been drawn out more. There is plenty missed still… I disagree that it’s a children’s story – it’s as epic a tale as the LotR saga, and they are well tied together so far. There are elements of the LotR books they couldn’t fit into the previous trilogy that are well worked into this one. Still unsure how I feel about the epic battle within the halls of Erebor, it played out amazingly well on screen, and mirrored slightly the battle / fleeing scenes in Moria. I was fortunate to see it in 3D HFR VMAX – the full impact of that may not be clear until I see it transition to a small screen. Thanks for the extra info, James. I’m glad Gandalf’s side trip is mentioned as one-liner in the book. I had a feeling it might be, but it’s so long since I’ve read that section of the book… And I agree they could have given the Beorn storyline a bit more weight, given how much weight everything else got. As for The Hobbit being a children’s story — I think it’s mainly in the way it’s written. I agree the events themselves are epic enough. But the dwarves are depicted as being a bit foolish in the book and Bilbo as quite childish. There’s also the strong narrative storyteller’s voice that makes it a children’s tale. That’s my interpretation anyhow. I’m interested as to which elements in LOTR are worked into The Hobbit? I’m probably not as familiar with the books as you. I saw the standard version of the film. Might go check out the 3D HRF version, although not sure I’ll like the bit where that head flies out of the screen!! Nice review, Ellen! I do wonder about the different aspect of Legolas we see in this film. He seems almost like a different guy than the Legolas of LOTR. I actually thought the pacing in this film was tighter than that of AUJ, but for me, AUJ had some quieter passages that caused me to like it more than this one. Totally agree with you that Martin Freeman is a perfect Bilbo (would have liked a little more of him in this one), and I thought Lee Pace’s Thranduil was kinda awesome — what did you think of him? Thanks, Jill. I know what you mean about Legolas seeming like a different person, but I can only assume (hope) they’ll explain this somehow. As for Thranduil, I thought he was great. Lee Pace seemed to capture the right balance of capriciousness, arrogance and willfulness one might expect from the elven king. I agree there could have been more Bilbo too. Yes! Great way to describe Thanduil. He’s a complex elf!